As the main character in Charles Dickens’ holiday 1843 classic “A Christmas Carol”, Ebenezer Scrooge was as despicable miser who abhorred everything that had to do with Christmas. On Christmas Eve, Scrooge was taken by ghosts to see the past, present and future as if he didn’t exist. Seeing these incidents transformed Scrooge and gave him the true spirit of Christmas into Scrooge. When Dickens wrote the play he hoped to renew and interest in Christmas tradition which he felt were falling into decay. Scrooge costumes are a grouchy, fun costume for Christmas school plays and holiday pageants. Scrooge is portrayed as an older man, hunched over a cane dressed in the Victorian style of the day. A drab pair of pants with matching frock coat and several woolen scarves will give you a Scroogy look. Add a grey wig, top hat and a pair of wire rim glasses for an elderly 19th century man. 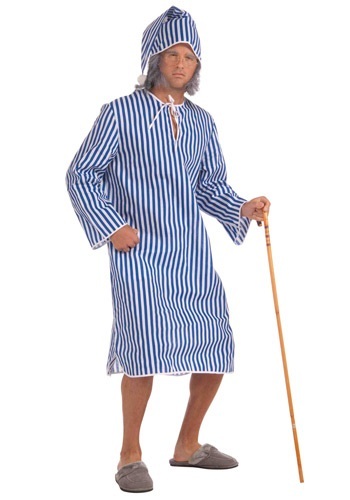 You can also dress in a Scrooge costume that resembles the nightshirt he wears during his visits from the ghosts of Christmas Past, Christmas Present and Christmas Still Yet To Come. An ankle length gown with matching stocking cap and a pair of your own slippers will give you an anything but “ba humbug” look.